In the spring of 2007, after Energy Department analyst Erik Shuster circulated a document revealing that 151 new coal-fired power plants were slated for construction, climate scientists sounded the alarm. Coal is the most carbon-intensive and plentiful of the fossil fuels. If the wave of massive new facilities was built, there would be little chance of preventing greenhouse gases from reaching truly dangerous levels. In response to the crisis, hundreds of local and regional groups, along with a handful of national groups, rose to the challenge of blocking the wave of proposals. 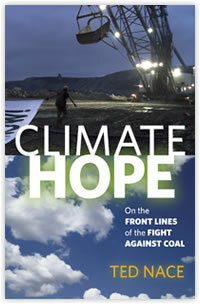 Climate Hope: On the Front Lines of the Fight Against Coal reveals for the first time the organizing methods and political tactics that enabled underdog activists in state after state to take on and defeat Big Coal, one of the most politically dominant industries in America. By late 2009, following two years of intense mobilization, opponents had derailed at least 109 proposed plants, bringing the coal boom to a sputtering halt. Attorney Carol Overland, whose startling revelations of runaway costs eviscerated proposed coal plants in Minnesota and Delaware. Coal baron “Buck” Harless, who rallied his industry to win West Virginia for George Bush in the 2000 election, ensuring that destructive mining practices would continue unabated for eight years. Navajo activist Elouise Brown, whose impromptu blockade in subzero weather turned the tide against Blackstone billionaire Steve Schwarzmann’s Desert Rock power plant. Climatologists James Hansen and Pushker Kharecha, whose calculations identified a phase-out of coal as the key measure capable of staunching climate chaos. Kansas governor Kathleen Sebelius, who risked political suicide by repeatedly vetoing the Sunflower coal plant. Coal flak Bob Henrie, who masterminded the industry’s “clean coal” campaign. Organizer Ted Glick, whose Washington, D.C., hunger strike and Vietnam-era organizing skills inspired and instructed a new generation of activists. Youth activists Hannah Morgan, Kate Rooth, and scores of other direct action protesters who conducted lock-down blockades at mines and coal plants, despite repeated police use of pepper spray, taser guns, and pain compliance holds. Attorney Bruce Nilles, who forged the Sierra Club’s pioneering campaign against coal while most other national environmental groups sat on their hands. Rainforest Action Network leader Mike Brune, whose organization’s protests against banks exposed the coal industry’s financial underbelly. Organizers Dana Kuhnline and Sierra Murdoch, whose Power Past Coal campaign sparked over three hundred grassroots protests. The victory of the anti-coal movement is a bright spot in the worldwide efforts against global warming. The success of its organizing methods provides an inspiring example of ordinary people mobilizing, fighting, and winning. Four: But We’ll Freeze in the Dark!